Why everyone and their grandmothers don’t get rich investing in the stock market? It sounds straightforward enough to invest. All one has to do is buy an appropriate market index fund (or ETF) and hold it for ten or twenty years (the well-known buy-and-hold strategy). If you achieve an average return for twenty years, your stock holdings could grow eight-fold ($823,015 from an initial investment of $100,000). So, why aren’t more individual investors earning those kinds of returns by holding stocks? It shows relative valuation of Fairfield Sentry (an investment fund) and the S&P 100 index (top 100 blue-chip companies) from 1990 to 2005. 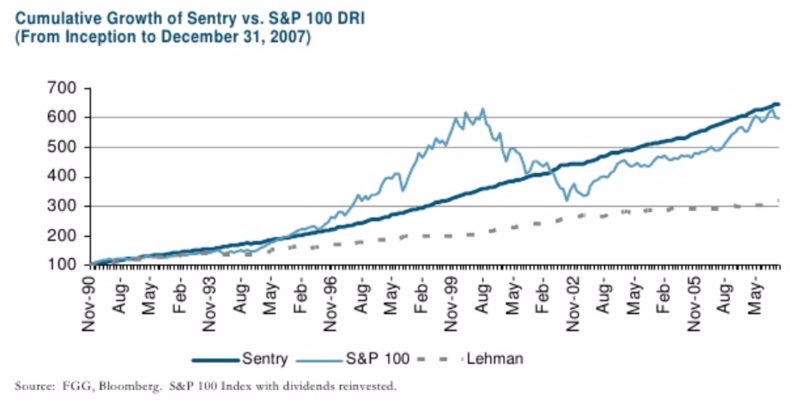 [For this discussion, ignore Lehman’s returns shown on the chart.] Over this 15-year period, the two investments’ performances were about the same with one glaring difference – Sentry fund was far more stable and consistent in generating monthly returns. The stock market (represented by its top 100 companies) was a lot more volatile – peaking in 2000 then dropping off in the ensuing bear market before finally recovering in the last two years. The time period for this table is slightly longer but it illustrates the same general trend. Both investments returned roughly the same for the period. But take a look at the worst drawdown for both funds. The S&P 100 dropped in value by nearly 50% once in that period. Sentry, on the other hand, had its worst drop at less than 1%. It’s easy to guess which one of these two investments investors would be attracted to. Who wouldn’t pick an investment that returns about the same as the stock market albeit with near-perfect stability. And yet we now know that the Sentry fund was an outright fraud and its returns were not real. Fairfield Sentry fund was a feeder fund to Bernie Madoff’s Ponzi investment scheme. Its clockwork like consistent returns were all made-up – not reflecting any real economic returns. Only someone like Bernie Madoff could promise and deliver steady 10-12% return year after year. Until it all blew up. This, in a nutshell, is the dilemma investors face. We love high returns, but we also prefer steady consistent returns. Stocks will give us high returns over long periods of time, but returns won’t be steady year over year. Bonds could give us steadier returns, but they won’t be as high. Average annualized US stock market return over 20 years is more than 5% higher than US bonds. You shouldn’t own common stocks if a 50% decrease in their value in a short period of time would cause you acute distress. Stocks will always be more volatile year over year than other assets. It’s because their daily prices are influenced by human emotions. When things are going well for the market, investors become overconfident and greedy – driving prices even higher. And when the tide turns, investors gradually become disenchanted, eventually losing faith, and causing the prices to undershoot their average return. And the cycle repeats! I previously wrote about how investors’ own behavior leads them to trail market performance here. If we stop chasing rainbows and embrace volatility, our investments will do fine – no matter how the stock market behaves in the near-term.